i recently started to embark on a little 3 part series involving taking a pdf document of a baseball field and doing some silverlight and asp.net ajax love with it. it led me along a path of creating some intense xaml design elements actually and i thought i'd share (in simpler form) the process i used. 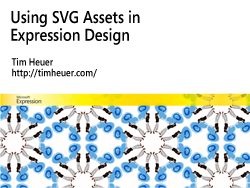 expression design is a graphic tool that enables creating vector art that can then be exported to xaml (either WPF or silverlight). it is a great tool that i'm starting to be more and more familiar with. design understands various import and export format but sometimes your existing assets might not be directly importable. have no fear there is a simple process (hopefully someone will automate this in one of their tools). i just added a podcast (feeds listed on the left of this site) demonstrating the steps i used to convert an .svg file to readable in expression design, then export to silverlight xaml for an application. it's only 8 minutes and might help if you are running into similar challenges. you'll see that pdf documents with graphics also might give you some love.